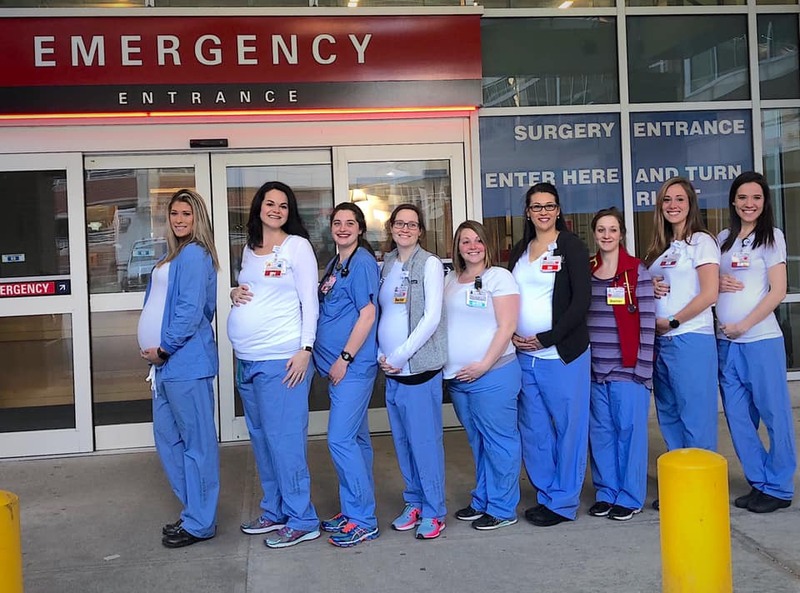 Not to be outdone by their 9 pregnant colleagues in Maine Med's Labor and Delivery Unit, workers in the Emergency Department go public with news that 12 members of their staff are expecting. Just days after nurses in Maine Medical Center’s Labor and Delivery Unit announced that nine of them in the unit were pregnant, their colleagues in the hospital’s Emergency Department went public with even bigger news. Melanie Ann Smithgall, who works as a registered nurse in the Portland hospital’s ER Department, posted a photograph Wednesday on her Facebook page that shows nine pregnant co-workers. The photograph was missing three other workers, two pregnant nurses and one expecting father who also works as a nurse. Smithgall said the 12 due dates range between April and October. “Don’t drink the water in the ER at Maine Medical Center,” Smithgall warned in her Facebook post. “Something is definitely in the water here at Maine Medical Center on the Labor and Delivery Unit,” Brittney Verville, a maternity nurse, posted on Facebook on Saturday. Verville’s co-workers’ due dates fall between April and July. The Labor and Delivery Unit employs about 80 nurses and the hospital doesn’t anticipate having any staffing issues because of the pregnancies. “Six of the nurses work the same weekend shift. With several months to prepare, the hospital has proactively planned to cover all those shifts,” the hospital said in a news release posted on its website. Spokesman Matt Wickenheiser said Maine Medical Center employs nearly 8,700 people. Wickenheiser said the probability of a baby boom occurring from time to time, especially with a workforce that large, is not surprising. Meanwhile, Smithgall’s Facebook post was garnering a lot of likes and comments.